There are three species of Daisy Fleabanes in the Garden. Their leaf characteristics are somewhat different. 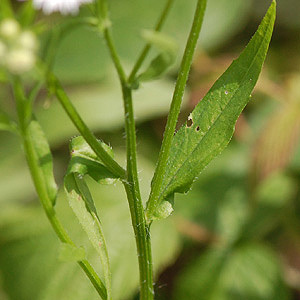 There have both basal and stem leaves. Ray florets vary in number with the ray color anywhere from white to pinkish. Disc florets are always yellow and quite numerous. Flower heads are 1/2 to 3/4 inch wide. Seeds (cypselae) have a bristly pappus attached. Stems branch only in the floral array. Hybridization may cause the actual plants pictured here to actually be somewhat of a cross between the species. There have been recent changes in the scientific classification of these plants and the latest names are used below and those the common names are multiple and confusing but I have attempted to list the most generally accepted common name first. 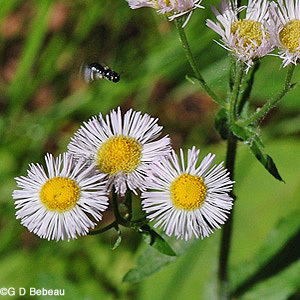 ABOVE: Eastern Daisy Fleabane or Annual Fleabane. (Erigeron annuus (L.) Pers.). Has 80 to 125 ray florets, several to usually more than 5 heads in a cluster. Flower stalks hairy. Stem leaves toothed but not clasping the stem, hairy edges and underside. Basal leaves (3rd photo) on winged stalks, coarse teeth. Stem hairy with hair noticeably standing out. Prefers dry ground. Full info and photo page. 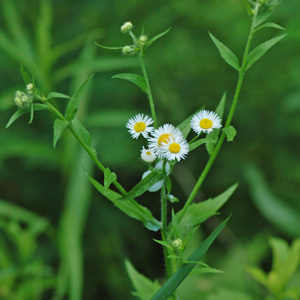 ABOVE: Philadelphia Fleabane or Common Fleabane or Marsh Fleabane. (Erigeron philadelphicus L.). Has the most ray florets - 150 to 400. 3 to 35 heads in a cluster, usually more than 9. Flower stalks have hair. 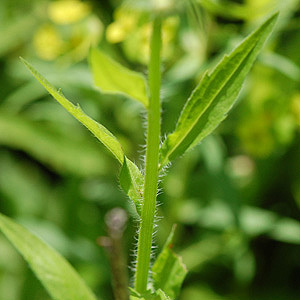 The upper leaves clasping the stem; stem hairy with soft hair. Stem leaves lance-like with teeth except the very uppers. Basal leaves (3rd photo) with rounded teeth and rounded tip and a long stalk. All stem leaves hairy. Prefers more moist ground .Full info and photo page. 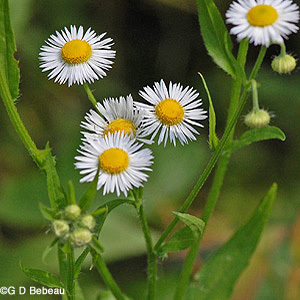 ABOVE: Lesser Daisy Fleabane, Prairie Fleabane, Rough Fleabane, Common Eastern Fleabane. (Erigeron strigosus Muhl. ex Willd.) Has 50 to 100 ray florets, usually more than 9 heads in a cluster atop the stem. Flower stalks hairy. 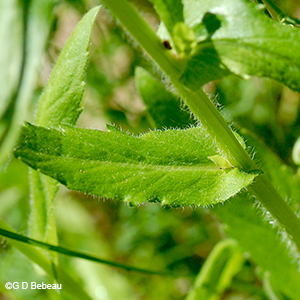 Stem leaves almost entire, not clasping, stem hairs lie closer to the the stem, either appressed or ascending. Stem sparsely leaved. Basal leaves (3rd photo) more elliptical to spatulate with a stalk. Prefers dry ground. Full info and photo page.